Holyoke Man Succumbs to Pneumonia in his 83rd Year — Was Last of Family. Alexander Day, 83, died at his home on Northampton Street, Holyoke, in the Elmwood section yesterday forenoon, after a short illness with pneumonia. 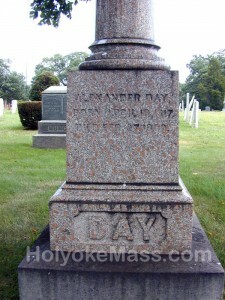 Mr. Day’s wife died about three months ago, and the bereavement undoubtedly hastened his death. Mr. Day was the last of his particular family, he leaving neither son nor daughter. He leaves one sister Mrs. Chester Crafts, who lives in the famous old Crafts Tavern on Northampton Street. As a singular coincidence, his cousin, Isaac Day, who lives near the site of the old Day place in Springdale, is also very ill and not expected to live. Mr. Day’s father, too, was named Alexander and they lived in what is now called Springdale, not far from John Prew’s house. Mr. Day, senior, was interested in the old ferry at this point. The Days lived on the place till about 17 years ago, when they moved into the present home on Northampton Street. 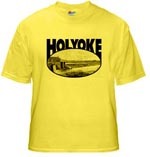 Mr. Day was known to more people in this section as an authority on old Holyoke history than almost any one individual. 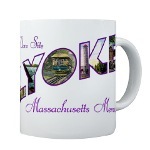 He belonged to one of the fast passing families of old Holyoke when “Ireland Parish” and “Baptist Village” were names that meant something, and Holyoke’s canals were yet unbuilt. Simple of habit, of late years careless in minor matters of dress, he maintained the old dignity that the present generation only knows of by the few examples yet left of the old school. Those who desired knowledge of the early days turned instinctively toward his home on Northampton street, and to all he was the same thoughtful, approachable and kindly old man. Not losing touch with the things that were new, he yet loved to dwell on the things that were old; and gifted with a remarkable memory, he could picture old Holyoke, old places and remember old landmarks better perhaps, than any other of the older men In his early days he taught school in more than one of the little schoolhouses of old Holyoke. 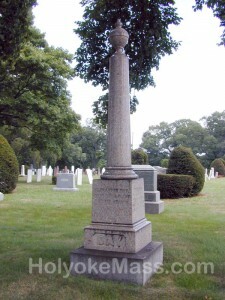 He was prominent in the early affairs of the town and the church. To the last he stood, walked of sat as straight as an arrow, a continual rebuke to round shoulders. Those who have tried in greater of less degree to note the past events of the city, as related to church or municipality, have gotten some of their most important historical data from Alexander Day. He was a member of the First Baptist Church parish and the funeral, which will be held tomorrow afternoon at 2 o’clock will be in charge of Rev. Dr. M. A. Wilcox. Note: The Holyoke City Directory of 1899 has Alexander Day living at 496 Northampton Street, Elmwood — which doesn’t make much sense using contemporary maps.